Attention vendors please call (979) 836-6011 to reserve a booth today!! Wow!!! 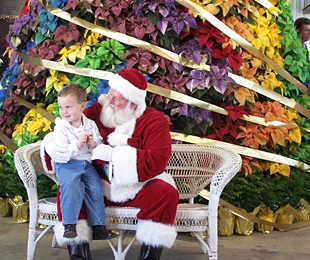 Can you believe that a month from now Santa is going to start heading this way from the North Pole to be here in time to kick off the 22st Annual Poinsettia Celebration on Saturday morning at 10:00 a.m.? It seems like just last week I was taking my picture with him keeping the reindeer from eating the herbs. Make sure you come and visit on Saturday and/or Sunday from 10:00 a.m. to 4:00 p.m. November 17th and 18th. It is truly something to see so many beautiful poinsettias in bloom-even for those of us that have grown them during the worst drought and heat I can remember. It is amazing to see them so beautiful. God is awesome indeed! Speaking of Santa... I believe there have been more pictures of Santa with adults than children. Maybe it is because we are all children at heart and love to believe in miracles. Santa has been a part of the Celebration for almost as long as we have had it. He is on his second generation of pictures and wish lists. The Celebration would not be the same without our wonderful Santa. 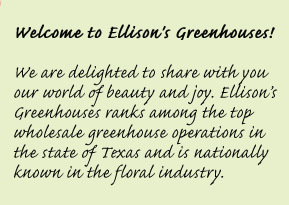 Ecke Ranch, who is the breeder of most of our poinsettias, has been here every year since we started. 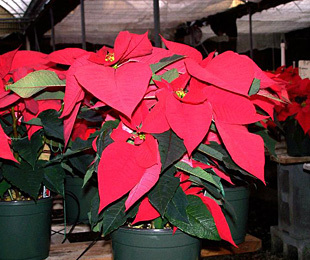 They will be here once again and can answer any questions you have about poinsettias. 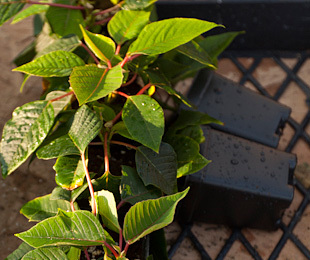 You will also be able to view and pick your favorite poinsettias from the new trials. We have great vendors again this year. Some are new and some have been here since the beginning. They are all wonderful. From food to wooden and metal sculptures and from rain gauges to soaps and jewelry; we have the finest group of people with great items to offer. The team at Ellison's, the volunteers and the vendors look forward to helping you make a special memory and celebrate the incredible gift of Christ so we can know His amazing love and all that truly matters. We’re a whole lot more!